This seems like an appropriate time to explain a bit about what I was trying to do with Cultivation. I live with my spouse and child in the small town of Potsdam, New York. We're pretty active in our community, through our food co-op, through our town's fight about Wal-Mart, through the non-profit Seedcorn, and even through our controversial choice of landscaping. Throughout my three-year experience as an active community member, I observed (and participated in) many conflicts that erupted. Some conflicts were over relatively small things (like paper vs. plastic bags for co-op-made bread), while others were over much bigger things (like a 186,000 square foot store being built in our 15,000-person town). I was discussing the Wal-Mart fight with a veteran of the local activism scene. He brought up the idea of "using war as a metaphor" for our struggles---he said that these days, he strives to avoid thinking about community issues in terms of win-or-lose and us-or-them. Instead, he said, the community itself, and the relationships in it, are the most important thing. A few days later, I was discussing the Wal-Mart fight with a Christian. He talked about how the fight had created a terrible discord in our community, and that the damage caused by that discord was worse that whatever damage having (or not having) Wal-Mart would do. Those two conversations caused me to think about how I approach conflict in real life, but they also caused me to think about game design. Many games deal with conflict, but almost all of them paint conflict as black-and-white. These game reward scorched-earth victories (and may make such a victory the primary goal). I wanted to make a game that explored the subtle trade-offs involved in conflict. On the one hand, you want to fight for what you think is right, but on the other hand, the fighting itself can have enormous costs for both sides. Is it better to compromise with your opponents and end up with a result that only seems half-right to you? This conflict balance is lurking everywhere, from small community squabbles to the global "war on terror." For example, should "we" negotiate with "terrorists?" That is a difficult question, certainly. Of course, every conflict has a setting, and I needed one for my game. I didn't want to make yet another game about war, so I spent many months thinking. I could make a game about a Wal-Mart fight, but that felt too much like jumping on the persuasive games bandwagon (there's a McDonald's Video Game, but did I want to be the creator of the Wal-Mart Video Game?). I was feeling particularly stumped on June 16, 2006, so I took a walk out into our backyard garden to clear my head. The general mechanic I was considering at the time revolved around compromise---sometimes, it might be best to give up something that you want in order to end a fight with your opponent and move on. You could think about this general mechanic in terms of gaining and losing ground. While I was sitting in my garden, an idea came to me: when neighbors are growing food together, conflict might erupt over the boundaries between neighbors' plots. Back in the house, I scribbled down eleven pages of notes in what felt like eleven minutes. Those eleven pages were a rather complete---albeit rough---design document for what I would eventually call Cultivation. The next three months were consumed by coding as I turned the design into a game. Implementing the mechanics for the social simulation was relatively easy. As far as "content" was concerned, I already had the groundwork for a nice solution---for years, I had been exploring genetic algorithms for content generation, but I had never found any use for the fruits of those explorations. Applying these ideas to Cultivation, I tried several ways of mapping genetic parameters to plant leaf shapes, and I finally came up with an algorithm that carried out a rough simulation of cell growth to fill a texture map. My first test of this algorithm simply generated 50 leaves and saved them to disk as image files. Watching a slide show of the resulting images stunned me---I was looking at some of the most beautiful 32x32 pixel images that I had ever seen. There were endless variations of form, and just when I thought I had seen every possible "style" of leaf generated by this system, I would stumble upon yet another leaf that looked like nothing I'd seen before. Still to this day, while testing Cultivation, I am surprised by the unique and interesting plants that appear on my screen. 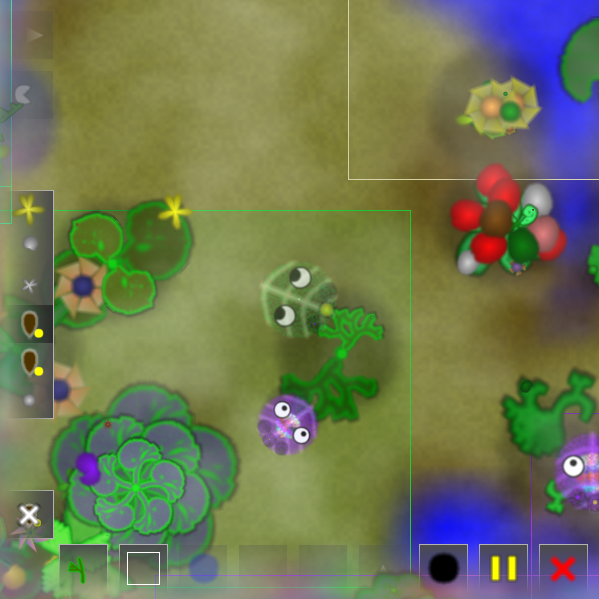 With this success behind me, I continued to apply genetic and procedural ideas to the rest of the graphical content: to flowers, to fruit, and to the gardeners themselves. When I was finished programming all the content, I had a graphical game without a single pre-rendered texture map or sprite. This was a game with endless visual variety that still fit on a single floppy disk. In the initial release of Cultivation, neighbors would respond to encroachment with both counter-encroachment (claiming some of your plants as their own) and social scorn (refusing to mate with you). With only these mechanics in place, fighting just didn't feel serious enough---a fight could continue indefinitely without any real consequences, since after two plots overlapped completely, no further revenge was possible for either side. I had to think of a more serious act to crown the peak of an escalating fight. Poisoning, which is now a key mechanic in Cultivation, fit perfectly. This mechanic allows an angry neighbor to poison a plant. Poison not only kills the target plant, but it also renders the ground around the plant forever unusable. With poisoning in place, fighting has a serious consequence: part of a common resource (fertile ground) is ruined for everyone. Thus, the mechanics of the game underscore what I was trying to explore as an artist. This leads me to the point of this article: games can convey a message in a way that other media cannot. As an example, let's consider the novel as a medium for conveying a message. First of all, we could come right out and state our thesis to the reader: "Conflict can cost both sides more than either stands to gain by winning." Of course, a bald statement like this might not be very convincing, and it is certainly not much fun to read. Instead, we could tell a story in our novel that somehow illustrated this point (the book/film House of Sand and Fog comes to mind). Even if we never come right out and state our thesis in plain words, a perceptive reader would hopefully understand the point of our story. After using either a direct thesis statement or an illustrative story, however, we have pretty much emptied our "novel" toolbox. The same set of tools are available in the other non-interactive media, such as film, audio, or painting. With games, we have those tools, too. We can come right out and state our thesis (by displaying text on the screen, or through a voice-over). We can also tell a story with our game that illustrates a point (as many adventure games do). We have one addition tool, though: we can construct mechanics that illustrate a point---mechanics that tend to lead the player down a particular path and toward a particular conclusion. For example, instead of telling a story about characters that find themselves trapped by a difficult decision, we can actually trap the player with a difficult decision and let the player experience the consequences of the choice that he or she makes. In Cultivation, the game system teeters on the verge of uncontrolled conflict, and the player can make choices within this system that affect the balance. Perhaps it is impossible to win the game by acting only out of self-interest, but likewise, it may be impossible to win acting only out of altruism (I say "perhaps" here because, even as the designer of the system, I have only explored a tiny fraction of the game's possible permutations). Players can directly see the results of the choices that they make. In his book A Theory of Fun for Game Design, Raph Koster explores the idea of building mechanics to convey artistic messages in great detail, so I won't discuss it further here. I will say, however, that I strongly believe we should be doing this. If we want to tell a story, why not just write a novel or make a film? If we are making art games, we should take advantage of the strengths of our medium: we should use interactive mechanics to help the player explore our points. I was amazed on how small of a file this game is. There needs to be more games that have 'genetic' posibilities. The poisoning metaphore didn't take long to hit home. Play long enough and the whole island is poisoned for everybody and you all eventually die off. I'm so glad this is open source. I might try to modify this with even more genetic possibilities such as have creatures that act more/less revengeful etc and maybe poisoning that doesn't last forever but has a timelimit so the game can self sustain and watch a civilization form and evolve to the best ratios of like/dislike/revenge/promiscuous/reserved tendancies and seeing what those might be. It is a very enjoyable game, and I have played it many hours. But there is a tendency for the AI to eventually go ahead and poison everything. Even if I kill off every AI (except one - if you fast enough) for procreation - eventually my own offspring will end up poisoning the land of their own genetic parents. Thanks son - you just poisened your dads last tree! My own off spring can get just as annoyed with me, and anyone else. All I can say is that it's incredible, for such a small program to be so true. Don't think I'm some kind of fanatic that plays 24/7... I'm saying that Cultivation is the first game, in a sense, of it's kind and I'm sure that it can provide the base for many more interesting games of its kind. I hope it will stay Opensource as it started, so that more people can actually come to understand your essay: the fact that it is Opensource means it aplies to every community, once we look at it. A lot of human society's mechanics bases itself on this. A wonderful analysis, and a wonderful game. Thank you Jason Rohrer.